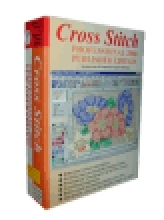 Cross Stitch Professional Platinum Publisher for Windows software. Suitable for Windows 95,98,2000,ME,SE, XP, 7, 8 and 10. Complete boxed product on CD with video help clips. Comes with 200 page printed manual - now in colour, free technical support and updates via the web for 2 years (1year for purchases from Jan 2018). Publisher version has inbuilt word processor for adding instructions, editing key. Also able to produce realistic display models without stitching and output colour separations for tapestry production. Can work with CMYK colours from thread specification right through to exported images and PDF.